Create desk and wall name plates for yourself, your boss or your entire company. It is possible to add a personal touch to any work space with custom desk signs displaying a name and a title. At home, a name plate can be used to decorate with loving expressions such as "World's Best Grandad" or quotes such as "Dance in the Rain". Shop our complete collection. Plastic: The top layer of two-ply plastic is removed by engraving to create classic two-color name plates. Durable and scratch resistant these nameplates are an excellent solution for companies looking for custom plastic desk and wall signs. Metal: Name plates created using metal leave a lasting impression of quality wherever they are displayed. A variety of metal finishes are available including gold and silver metal, lacquer and mirror colors. Template Designs: Save the cost of set-up fees by choosing one of the six standard templates. 2x8 inch, 2x10 inch and 2x12 inch sizes with your choice of one or two lines. Name plates may be customized with your selection of material, color and font. 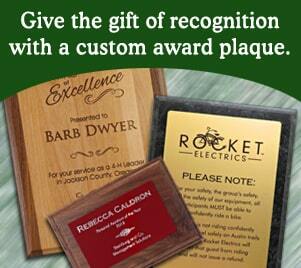 Custom Designs: Create name plates that meet your design specs by working with an experienced graphic designer. A proof of your design will be provided for your approval before production begins. Select size, text layout, color. Custom layout. 18 color combinations. Rotary engraved. 45+ plastic colors. 2x8 and 2x10, one and two line templates. 18 metal colors. No set-up fee. Adding a logo to a nameplate is an inexpensive way to maximize branding for both employee and company benefits. Engraved Logo (plastic or metal): The text and logo are engraved using our high-quality laser machines, creating a name plate with a one-color logo that matches the color of the text. UV Color Logo: High-quality logos with unlimited, bright colors and gradients. Only available on plastic material. Names and titles will be laser engraved. Hot-Stamped: Your logo will be hot-stamped with a metal stamp, heat and pressure onto the surface of your laser engraved name plate. Metallic foils are available. Plastic two-color nameplates engraved with your text and logo. Available in 29 color combinations. Unique, durable laser engraved metal plates. Available in 18 color combinations. Full color logo on a laser engraved name plate. Logo may have blends and gradients. High-quality stamped logo with engraved text. Metallic foils are available. A nameplate holder allows nameplates to be displayed on walls, cubicles or desks. Easily change information by sliding the plate into the slotted track. Metal wall mounts and metal desk holders are available in black, silver, yellow gold and rose gold. We keep the most common sizes (2x8, 2x10 and 2x12) in stock; custom sizes may be special ordered. 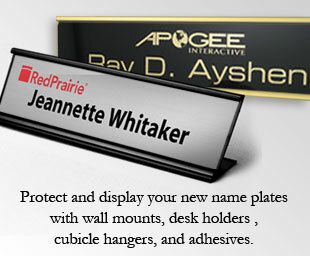 Desk bases and cubicle hangers provide additional solutions for displaying your nameplates. Display name plates on a door, wall or any other flat surface. Quality metal desk holders for name plates. With a slanted opening the base holder will prop the nameplate upright. Clear plastic clip attaches to a cubicle wall. Partition Pins to display name plates on padded cubicle. 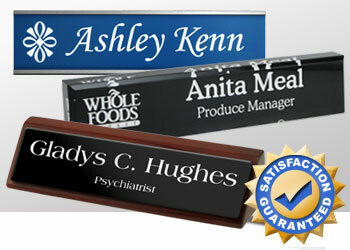 Use adhesives to attach your nameplate to a wall, cublicle, desk or anything else. Protect your name plate with a protective lens. Designed to complement any decor, Contemporary Name Plates are the perfect solution for an office or reception area. Easily create custom paper inserts with any image, font or graphic. These durable nameplates can last for years with proper care, gentle dusting and occasional spot cleaning is all that is required. Interchangeable attachments are available allowing them to be used on walls, cubicle partitions and desks. Perfect for any decor. Reuse these nameplates by printing new inserts as needed. Plastic lens and backplate snap together over a printed paper insert. Durable and easy to use. Perfect for providing information, name and titles for reception areas, waiting rooms and offices. Add text, logos or images with your inkjet or laser printer. Three inserts per sheet. NamePrint Graphics software is available to assist in printing contemporary name plate inserts. Reusable name plates are a cost-effective solution for high turnover and seasonal industries. Do-it-yourself office name plates make it easy to change the information on your office signs. Just use your laser or inkjet printer to create a new insert. Slide the insert into the existing holder behind the clear lens and you are done. Each name plate consists of four parts: a wall mount or desk holder, a metal back plate, the insert and a clear Lexan lens that protects the insert and holds it in place. An optional UV color logo may be printed directly on the metal back plate to help unify and brand all of the name plates in an office. Four-part reusable nameplates consist of metal back-plates, transparent inserts, Lexan protector and your choice of wall mount or desk holder. Metal back plates for use in the reusable name plate system. A logo may be UV printed onto the metal. Reusable name plates require a wall mount or desk holder. Available in four colors: : silver, black, rose gold and yellow gold. Clear Lexan is placed in front of the inserts to protect the surface from damage. For use with inkjet or laser printers. Three inserts per sheet. NamePrint Graphics software is available to assist in printing reusable name plate inserts. These thick desk blocks command attention and stand by themselves with no holder needed. Order with front engraving to give the block a solid look, or select back engraving brings out the depth and reflections of the acrylic. Give them as a gift or provide them for an entire office. These name plates look great on a desk, bookshelf or anywhere else you would like to display them! Available with an optional logo. Quality Desk Wedges, with their engraved metal name plates, show that you have set a level of excellence for yourself that goes above and beyond average. With a wide selection of wood and stone materials, you are sure to find one that will fit your professional office. 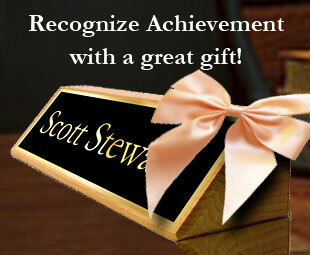 Executive name plates also make a great gift idea for that special person in your life. Personalize with a name and title, or use a favorite quote or saying. Four sizes 8.5 inch wedge, 10.5 inch wedge, 12.5 inch wedge. 10 inch wedge with slot for business cards. Two sizes 8.5 inch wedge, 10.5 inch wedge. Four sizes 8.5 inch wedge, 10.5 inch wedge, 8.5 in and 10.5 in with business card slot.